New Skoda Yeti Wins Award for Skoda. Is 2013 The Year of the Yeti? 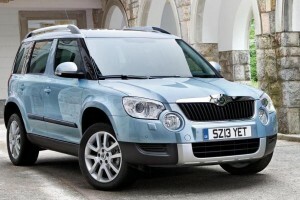 The Skoda Yeti has been named as the UK’s most satisfying car to own in an annual customer satisfaction survey. The result marks a spectacular hat-trick for the brand, having recorded first place finishes in 2011 and 2012. The Skoda Yeti has topped the annual Driver Power chart of 100 cars for the second year in a row with an overall satisfaction rating of 92.65 per cent – the highest recorded in this year’s survey. The influential report is compiled by car mag Auto Express using feedback supplied by car owners across the country. This year, more than 46,000 motorists were asked to rate their car in 10 key categories. The award wasn’t the only piece of good news for the car maker with three models in the top six for customer satisfaction. The Skoda Superb was named Best Family Car by readers, while the Skoda Yeti was awarded the Best Compact Family Car. The Skoda Yeti also saw off more expensive rivals in the survey’s in-car technology section. With an approval rating of 89.44%, the five-door crossover was named as the best for ‘In–car tech’, with praise for Skoda’s affordable and easy to use infotainment systems. Build quality was another area where the magazine’s readers felt the Skoda Yeti couldn’t be bettered. With an approval rating of 96.25%, the Czech-built car outscored rivals costing twice as much. Practicality scores across the Skoda range were equally impressive with three models featured in the survey’s ‘Practicality’ section, with the Skoda Superb being named as the best car for passengers and luggage. Launched in 2009, the Skoda Yeti has won more than 20 industry, media and customer satisfaction awards, including Auto Express Car of the Year (2010), Top Gear Family Car of the Year (2010) and Honest John Car of the Year (2011). The Skoda Yeti is produced in the Czech Republic. The Skoda Yeti really does score on so many levels but if you’re inspired to buy one then check out the leasing packages available before parting with any money. This entry was posted in Car Leasing, Cars, Crossover Cars, Family Car, Manufacturer News, News and Views, Popular Cars and tagged Auto Express, Best Family Car, caption, car, car technology, Czech Republic, Driver Power, lease the Skoda Yeti, skoda, Skoda Superb, Skoda Yeti, technology, UK, Yeti by Steve Lumley. Bookmark the permalink.